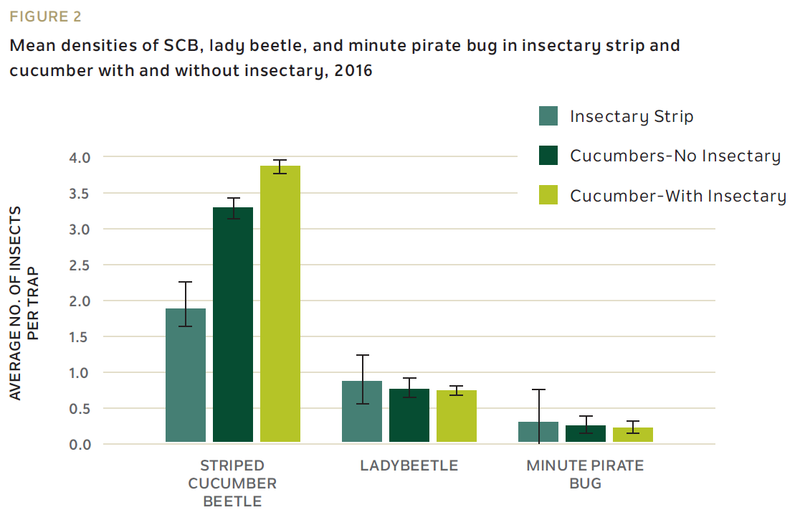 The article below is excerpted from Dr. Gladis Zinati’s Invite Insect Allies to your Farm Using Insectary Strips: Field Guide to Control Striped Cucumber Beetles. Download the full PDF here. For tips and information on establishing insectary strips, click here. 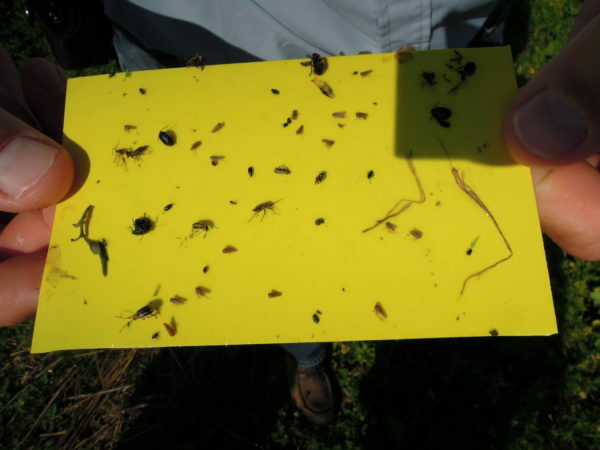 To learn how to monitor insect populations on your own farm, click here. 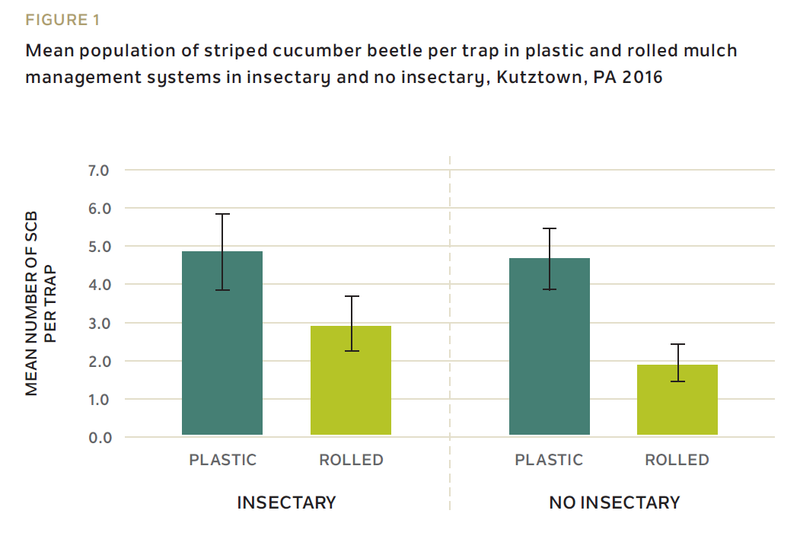 This research, conducted at Rodale Institute from 2015-2018, analyzed use of flowering insectary strips to combat populations of the striped cucumber beetle, which damage cucumber fruits and transmit bacterial wilt disease. 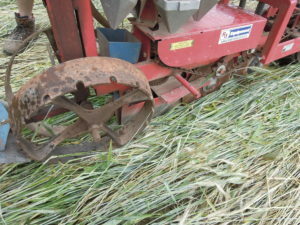 We also investigated use of the roller crimper to reduce weeds in organic systems without tillage or black plastic. The research and results are outlined below. Striped cucumber beetle (SCB) (Acalymma vittatum) is a serious pest of cucurbit crops in eastern North America. The SCB larvae feed on roots and stems while adult beetles feed on and defoliate cucurbit plant leaves, flowers and fruits; interfere with pollination and fruit set; and cause scars on cucurbit fruits that impact marketability. Striped cucumber beetle adults are about 1/4″ long, have black undersides, and two yellow and three black stripes on top. The three black stripes on the wings have distinct straight edges. Larvae are approximately 3/8-inches long, have white worm-like bodies with brown heads and three tiny pairs of legs. Striped cucumber beetles overwinter as adults in protected sites in wooded areas or within the field under old crop debris. When temperatures exceed 55 °F (12.7 °C) in spring, striped cucumber beetles emerge from overwintering sites and feed on the pollen of wild flowering plants. Once cucurbit crops are transplanted into the field, the SCB migrate to plants and aggregate to feed and mate. Ten to 20 days after mating, the beetles lay eggs in the soil at the base of cucurbit plants, which hatch a week later. Larvae take 2 to 4 weeks to mature, and then pupate in the soil over the next 7 days. The adults continue to move from one field to another. In Pennsylvania, later in the summer the adults emerge and feed on flowers, foliage or on the surface of cucurbit fruits. The second generation of SCB will eventually leave the fields to feed on pollen and overwinter until next spring. The SCB is also considered the principle vector of Erwinia tracheiphila, the causal agent (bacterium pathogen) of bacterial wilt of Cucurbitaceae. But the feeding and scarring damage is minimal compared to losses due to bacterial wilt. Bacterial wilt disease is characterized initially by rapid wilting of plants foliage and eventually the collapse of the whole plant, especially those exhibiting cucumber beetle injury. 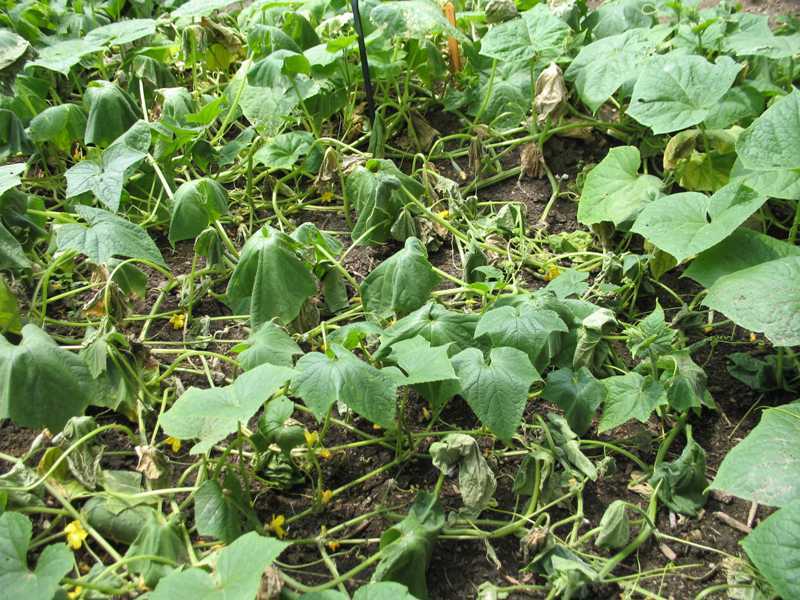 Cucumber and muskmelon are highly susceptible to bacterial wilt with yield losses of up to 80% reported, while squash and pumpkin are moderately susceptible. Cucurbit plants exhibiting bacterial wilt. Photo courtesy of the Missouri Botanical Garden. The bacterium that causes the wilt overwinters in the gut of some of the striped cucumber beetles. In spring the adults begin feeding and spread the bacterium either through their feces or from contaminated mouth parts. Lesions from chewing damage on plant leaves open entry points for the pathogen to be quickly transmitted and multiply through the plant’s vascular system, affecting water movement in the water conducting vessels and consequently, producing blockages that cause the leaves and the entire vine to wilt and die. The infected beetles continue to infect new healthy plants with the bacterium causing wilt as they move from one plant or field to another. Use of botanical sprays such as neem. 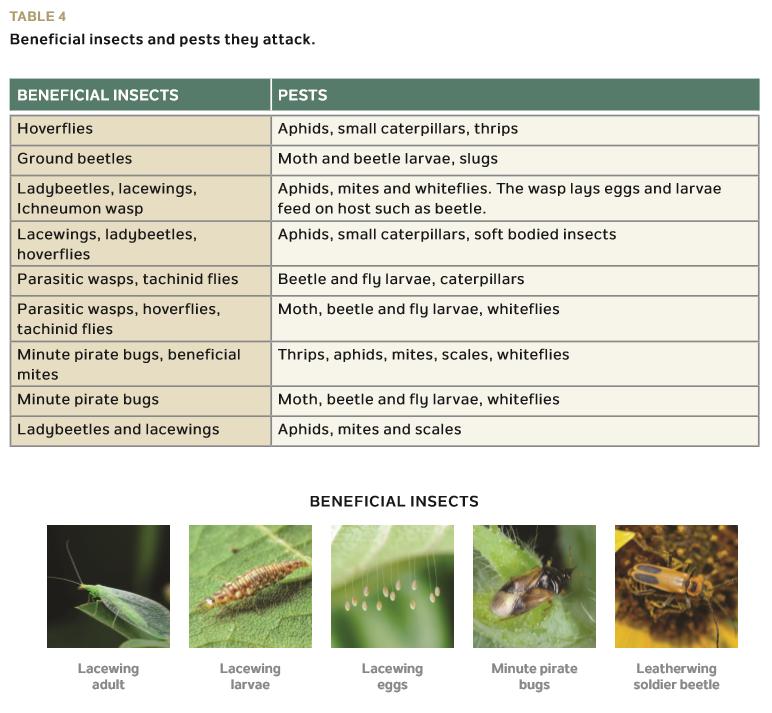 Each of the listed approaches has advantages and disadvantages and none of these tactics help in minimizing the feeding injuries, beetle populations, and/or transmission of bacteria. Similarly, if systemic neonicotinoids are applied closer to ﬂowering of cucurbit plants, research studies have presented evidence that higher residues of these chemicals are present in pollen and nectar which become harmful to vegetable crop pollinators such as honey bees. None of these approaches provide a long-term effect and sustainable, environmentally-friendly ecosystem to reduce SCB damage and improve productivity of organic cucurbit crops. 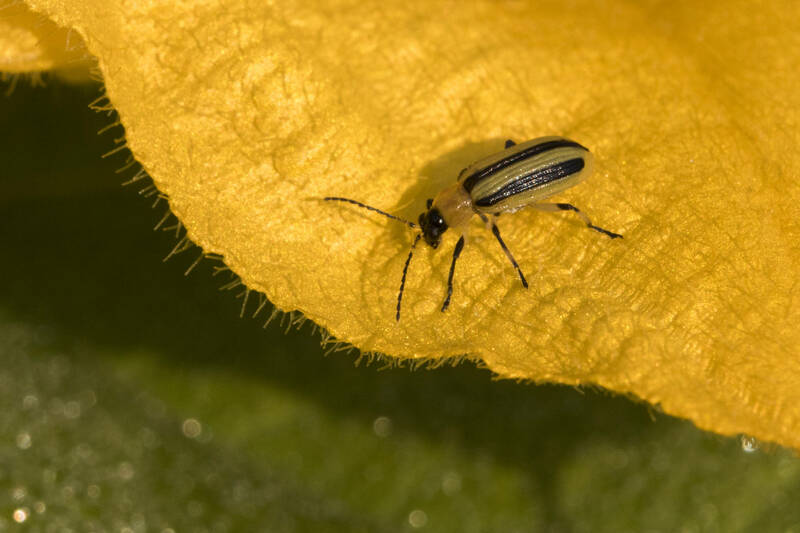 Because striped cucumber beetles are attacked by many natural enemies, one effective approach is to target the pest itself through its natural biological agents. To do so, it is important to protect natural enemies from disturbances such as pesticides and tillage by establishing and maintaining permanent landscape habitats. With time, such habitats will enhance the performance and increase populations of natural enemies that are used as biological control against SCB. 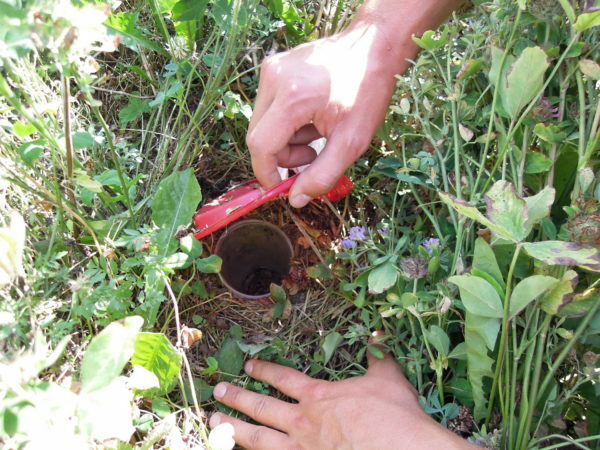 The goal of this project was to assess the impact of integrating insectary strips and reduced tillage on striped cucumber beetle pest density and beneficial insect populations, as well as on fruit production and quality of organic cucumbers. Insectary strips, each 5-ft wide by 30-ft long, were established in fall 2015 with alfalfa as a base plant and oats as a nursing crop. 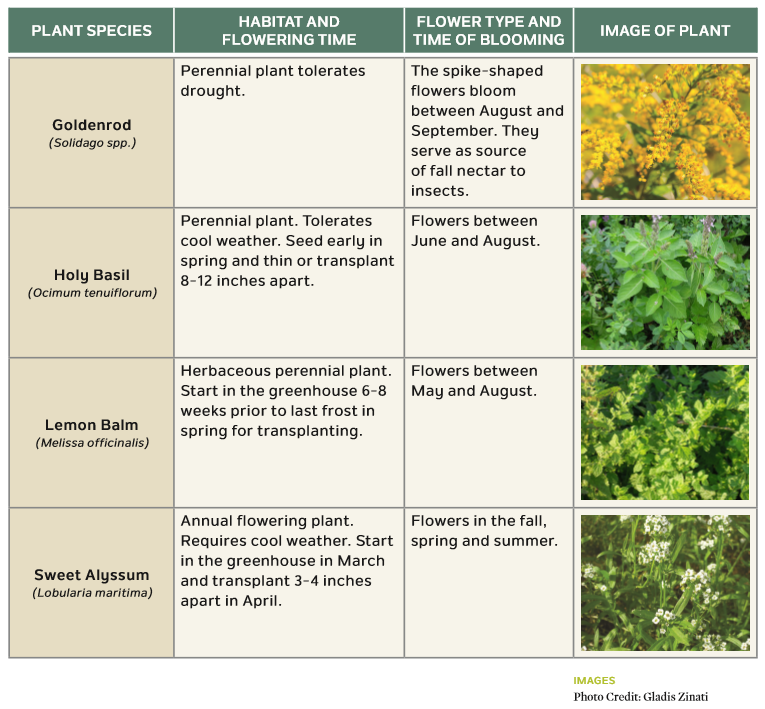 A suite of plants such as bouquet dill, sacred basil, resin calendula, alyssum, lemon balm, fava bean, peas, and sunflower was transplanted throughout April and May of 2016 and 2017. Insectary strips were placed every 25 feet of cucumber beds. 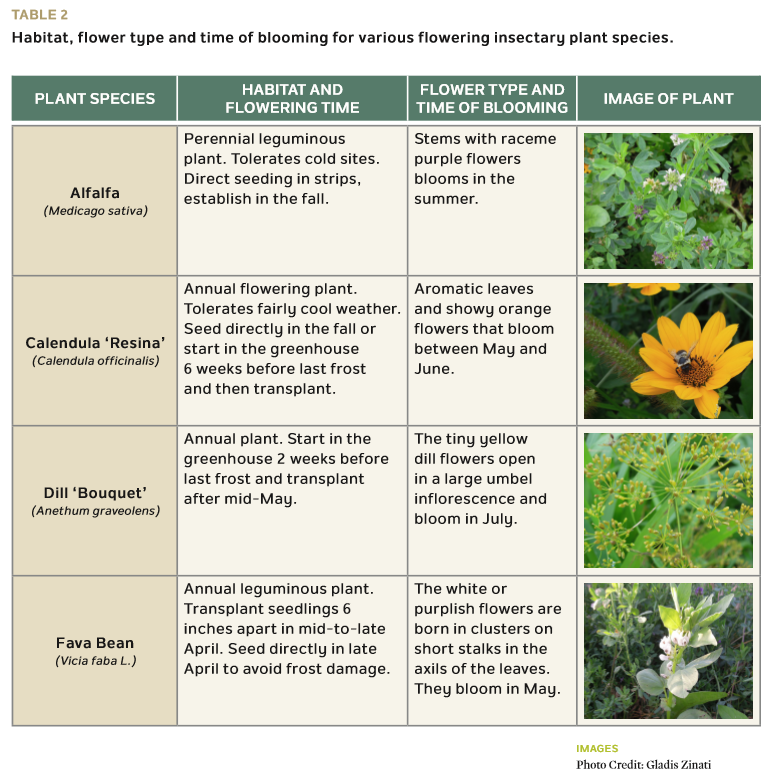 Plants without insectary strips were also included in these trials. 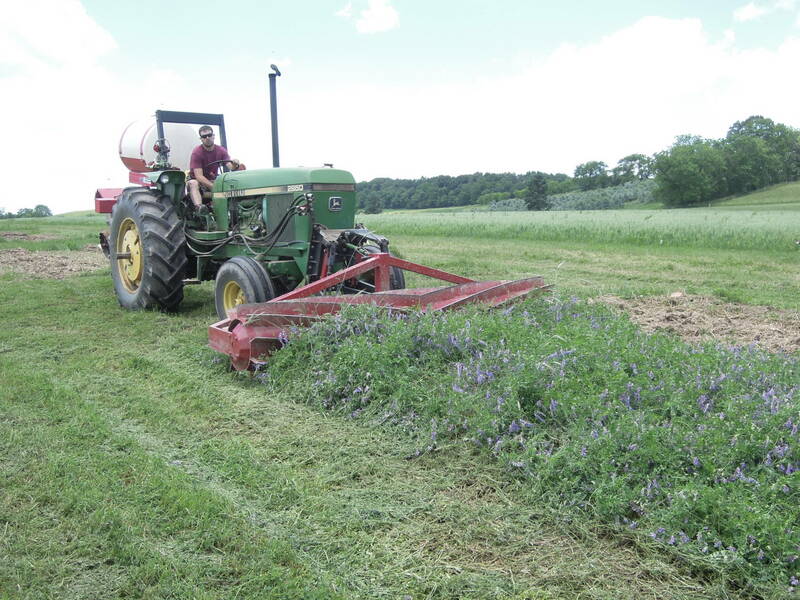 Two cover crop mixtures were tested in this project: a rye/hairy vetch (R/HV) and a rye/field pea (R/FP) mixture. These mixtures were planted in fall 2015 and 2016. In spring of 2016 and 2017 the biomass of these mixtures were either rolled-crimped with a roller-crimper or tilled-in and covered later with plastic mulch. Cucumber plants of the ‘Ministro’ variety were first started in the greenhouse and transplanted into tilled plastic mulch beds using a water wheeler transplanter or no-till transplanter on roller-crimped mulches without using any additional fertilizers. After transplanting the cucumber seedlings in plastic and rolled mulch, floating row covers were installed to protect the young seedlings from any attack by early visitors of adult striped cucumber beetles. 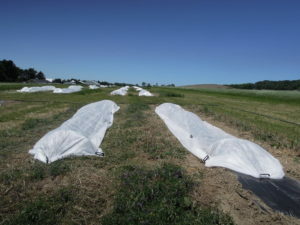 The row covers were removed approximately one month after transplanting (when cucumber flowers started to bloom) to allow pollinators and beneficial insects to reach the plants. Monitoring of pests and beneficial insects started immediately after the removal of row covers. Yellow sticky traps and pitfall traps were installed in the middle of the insectary strip and in the middle of each cucumber bed (each bed has 17 cucumber plants). Striped cucumber beetle pest and beneficial insects such as ladybeetle, parasitoids, and minute bug were monitored periodically. No organic pesticides were used during these field trials. Yellow sticky traps were monitored on a weekly basis whereas the ground beetles were monitored every two weeks. 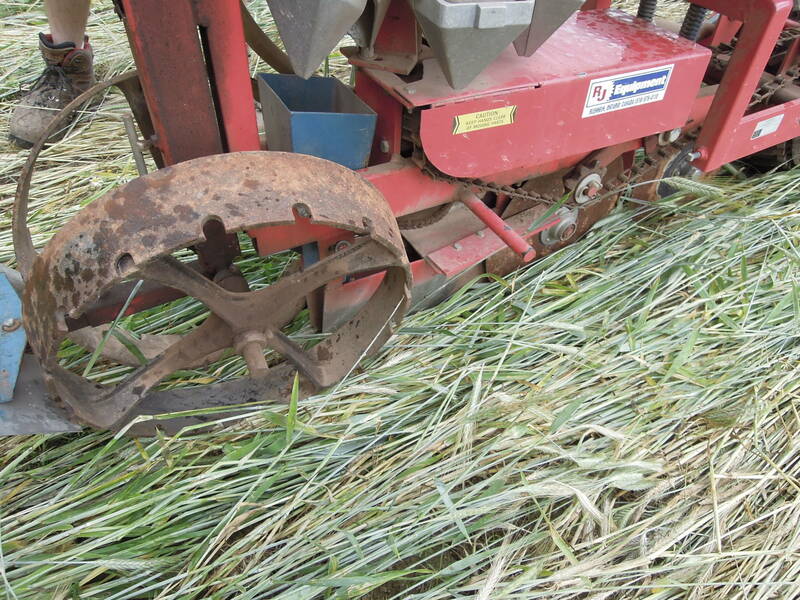 Roller-crimped cover crops covered the soil surface well throughout the season and reduced weeds biomass. Irrespective of cover crop mixture, cucumber yields were optimum and ranged between 400 and 670 bushels/acre in plastic much. Plants in roller-crimped beds would require additional fertilization to achieve maximum yields. 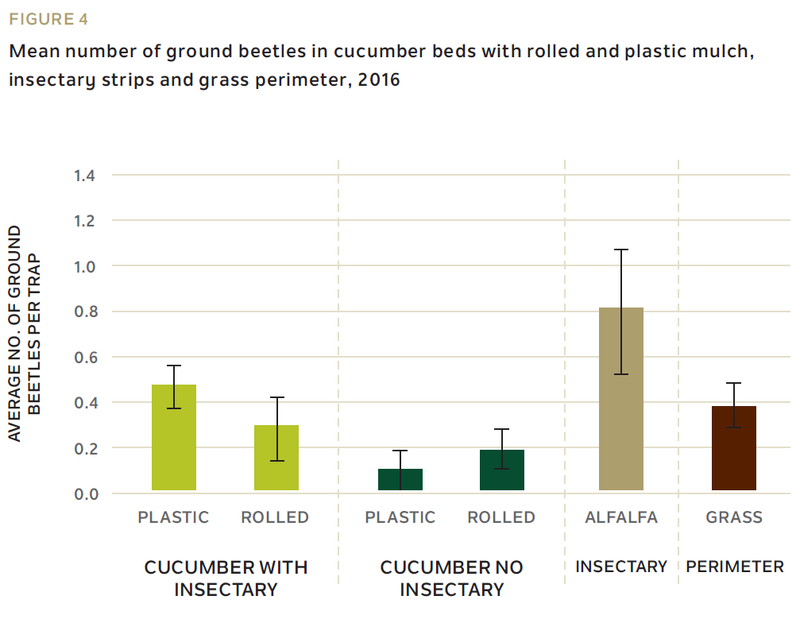 Significantly lower densities of the striped cucumber beetle were found in rolled mulch compared to plastic in 2016 (Figure 1). The SCB density ranged between 2 to 5 beetles per trap. However, in 2017, SCB pressure was lower than in 2016. Density of SCB population was about 0.9 beetles per trap in plastic mulch compared to 0.7 beetles per trap in rolled-crimped mulch. Ladybeetle and minute pirate beetles were the most dominant beneficial aerial insects identified on yellow sticky traps. The densities of these beneficial insects were 0.9 per trap for ladybeetle and about 0.3 per trap for minute pirate bug in 2016 (Figure 2). 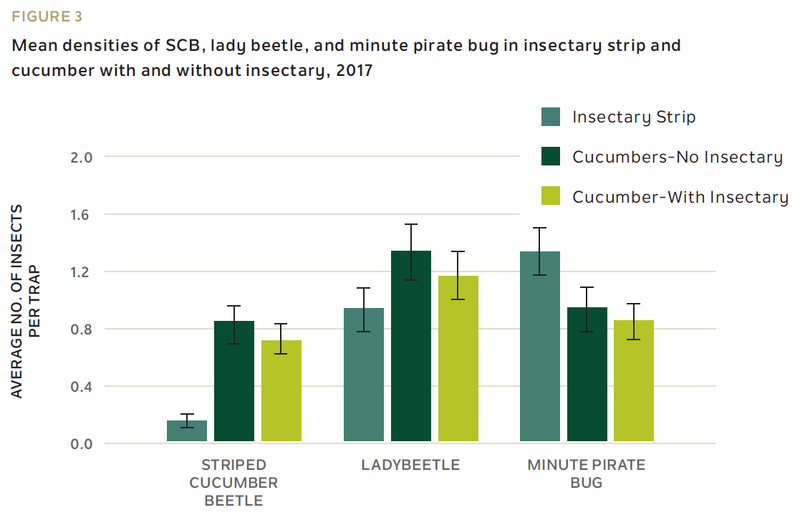 These densities, however, increased by 1.5 times and 4 times for ladybeetle and minute pirate bug, respectively in 2017 (Figure 3). 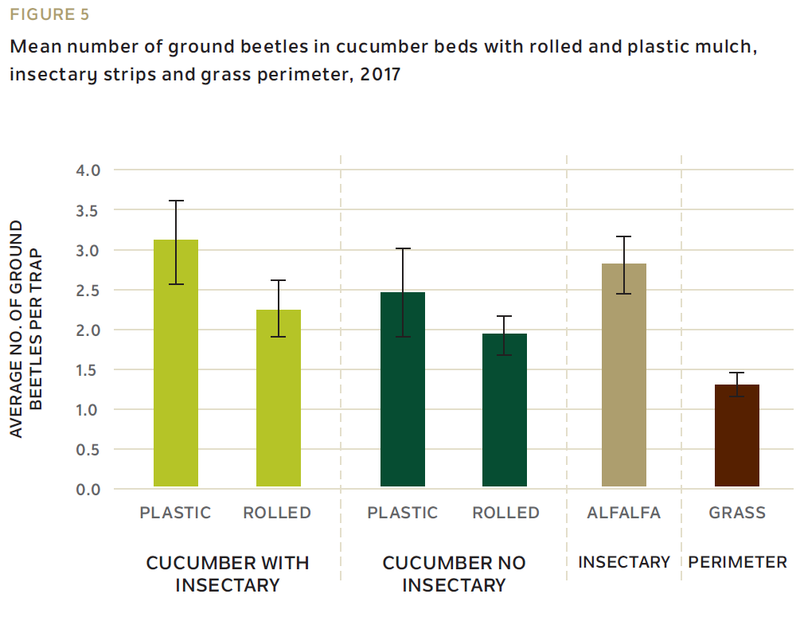 Ground beetle populations were highest in insectary strips, the grass perimeter, and in rolled mulch with and without insectary strips in 2016 (Figure 4). There was no significant difference in ground beetle population per trap between treatments, but the number of ground beetles increased 6 times more in 2017 and was highest in the insectary strips (Figure 5). Major ground beetle species identified during this two-year project included Chlaenius tricolor, Harpalus pensylvanicus, Scarites subterraneus (page 18) and Poecilus chalcite. More importantly, the cucumber plants did not show any symptoms of wilting in 2016 and 2017 production seasons. The yellow sticky traps revealed that flowering plants in the insectary strips attracted tachinid flies that parasitized striped cucumber beetle adults, as evidenced by the molecular techniques used during the two-year research trials. 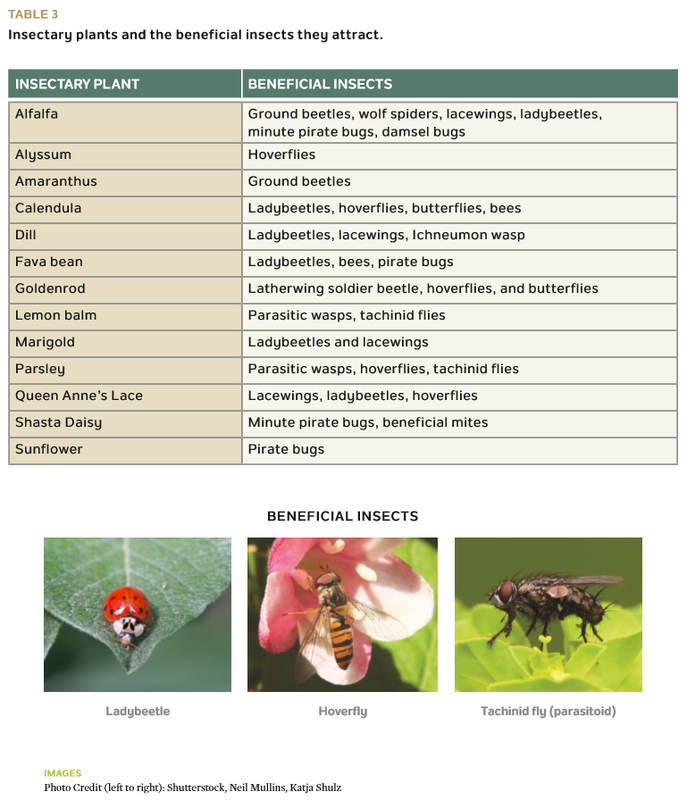 Results deduced from the two-year research showed that the integration of insectary flowering strips aided in inviting a diverse array of beneficial insect species, including ground beetle, ladybeetle, tachinid fly and minute pirate bug. The presence of these beneficial insects such as ground beetles, ladybeetles, and tachinid flies reduced survival of striped cucumber beetle. The use of roller-crimped mulch enhanced the presence of ground beetles and wolf spiders. 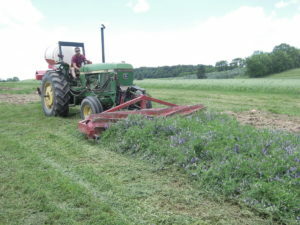 In roller-crimped mulch treatments, supplementing cucumber plants with organic fertilization was necessary at the beginning of the season (after removal of row cover). By enhancing the environmental habitat for beneficial insects that control striped cucumber beetle, the culprit for transmitting the bacterial wilt disease, the latter can potentially be controlled by using natural biological systems (insectary strips and rolled-crimped mulch) without the use of pesticides. Zehnder G. 2013. Farmscaping: Making Use of Nature’s Pest Management Services. Available online at https://articles.extension.org/pages/18573/farmscaping:-making-use-of-natures-pest-management-services.